Will be LIVE on 31st Jan 2019. Ask your questions here! (AMA Ended) Calling everyone who is looking to make your first investment in 2019. Ask the community anything! We know that taking the first step in investing is often a huge one for most Singaporeans. That’s why we decided to host this AMA to help you with your first steps. This AMA is special as the topics are focused on investing and taking that first step. The best part? 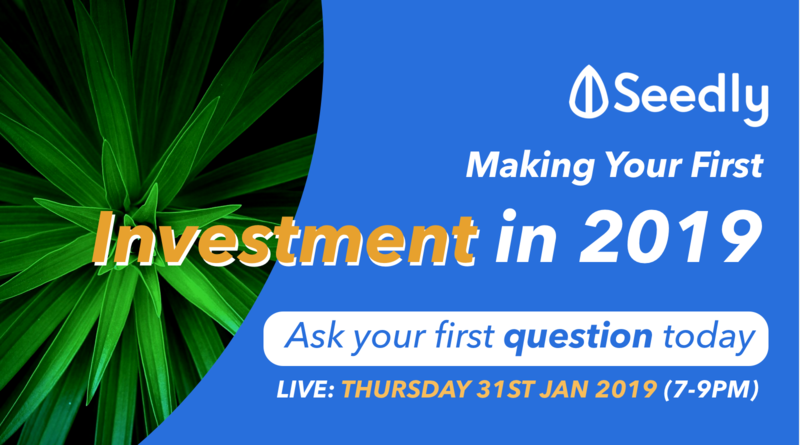 Our community - consisting of experienced investors and knowledgeable individuals - will aim to answer you by 31st Jan 2019, Thursday, between 7 to 9pm! When do I know when I should start investing? What tools do I need to start investing successfully? How much should you start with and how much is enough? What is the right strategy and mindset for an investor who is just starting out? Dollar Cost Average (DCA) monthly OR Lump Sum Investing (LSI): Which is better for me? Is investing in the STI (Straits Times Index) a good move for a first time investor? Should I buy an individual stock, an Index fund or a Unit Trust? Should I invest in a bear or bull market? Can (and should I) invest with my CPF? What does successful investing look like? NOTE: Questions answered by the community will be up to their discretion and preference. The AMA is moderated by the Seedly Team. So let’s keep the questions friendly and open! To our community members, if you see a question you can answer, do jump in as well :) We celebrate collaborative learning here! I have $40,000 spare cash to invest from an inheritance. I'm a first jobber and don't spend much, have no debts or financial liabilities. How should I get started? Have you spoken to any Financial Consultant? I would encourage you to do so. - Having that inheritance is a bonus - Do up a cash flow to understand your spendings and amount you are able to set aside - I believe you are young so time is to your advantage if you are looking at insurance coverage or investing for your lifestyle or future retirement needs - Understand your own risk appetite and what you wish to achieve if you were to do any form of investment - Understand that financial wealth is only figures in your bank account with no value if you are not using it to generate more wealth for you. Fixed deposit, Regular Saving Plan, Endowments, ILPs and investments are some different avenues you can look into. Your actions will lead to reactions/consequences. Equiped yourself with the knowledge to increase the number of choices you have. Only then, a decision with a consequence you can bear will be made. I want to start investing in individual stocks, what info should I research on and look out for in order to make an informed decision on what to invest in? Hi! Just a small add on point as to how you could systematically research on individual stocks: 1) Macroeconomic Analysis Looking at how current macroeconomic trends may affect future price movements for stocks eg: US-China Trade War? Brexit? Forecast of slower global GDP Growth by IMF? 2) Industry Analysis Looking at how the industry performance may be affected, perhaps due to global factors eg: oversupply of oil, leading to decreased profits for companies in the energy industry? Is this a dying industry? 3) Fundamental Analysis Looking at the specific company's health by looking at the ratios as suggested by the others. Hope this helps! Hi there! The answers given by the others are good and comprehensive But I would perhaps like to stress a point that the others might not have stressed yet, and that is, the learning of the fundamentals of any investment product. Yes, it is important to understand how REITs, bonds, and FX trading operates, but ultimately, it would be very helpful to understand what underlying factors affect the investment product you are looking at. Is it central bank interest rates? Is it a company’s earnings? Is it the trade war between US and China? Understanding how the investment products are affected by their fundamentals finally helps you to understand what kind of investment decisions to make, such as buying and selling, and how long to hold the products. Investment products, though are represented by numbers, are finally affected by real world events and happenings, and trying to understand what factors influence them is crucial. This also helps you to guard against panic buying and selling, and cautions you on being influenced by the herd mentality (“im going to buy this share because everyone seems to be buying it”) Such a learning task may seem daunting at first, but there are plenty of resources online, such as the website Investopedia, which offers some interesting insights into different asset classes. Perhaps focus on learning one asset class at a time, instead of rushing and feeling overwhelmed. Going head first and just buying and selling without much thinking is more akin to gambling than investing! The one ETF everyone knows about is certainly not diverse in nature (The STI ETF). Consider the all-in cost including any account fees, trading fees, managing fees, rebalancing fees. Recognize that this is designed to be a long term decision. Diversification should come across sectorally, not globally - meaning that it should be widespread across sectors like consumer staples, financials, tech, etc, not across countries like China, US, Malaysia, etc. Which is a little bit why the STI is a piece of gunk. You could do much better than an ETF, but its your call. What should my plan be going forward, having bought STI through its highest prices last year? ? Learn a new instrument, like managing a portfolio of options on US stocks. Its like operating a casino or an insurer in the stock market where you keep collecting premiums. 'Payouts/claims' can be fixed and turned in your favour. You don't need a high amount of capital as compared to the amount required to hold stock over time, and the returns are potentially much better compared to holding stock. What is the most tax-efficient way to invest in ETFs? US does not have a tax treaty with Singapore. So if you were to buy US stocks or ETFs, you will be charge 30% withholding tax on your dividends from US stocks/ETFs. Ireland have tax treaty with US. So Irish domiciled etfs only need to pay 15% instead of 30% for US stocks. What considerations are there for choosing ETF or funds that track the similar stocks or REITs? Hi there! Good question. I would consider a few things: 1) Invest in what you are more familar with. Is it the companies that make up the STI Index? Or is it REITs and real estate and you believe that the Real Estate market is doing well and sustainable? 2) Do you want to take on a more passive or active method? Active: Means you actually need to go and pick out REITS. There are REIT ETFs but here is an answer between REIT and REIT ETFs which was found here: "Personally I'll avoid the reit etf and just buy the individual reit counters. The Etf gives a lower return and there's management fees involved. I'll suggest going through a simple course on reits like the one from Dr Wealth to gain a basic understanding of reits before you start investing. You can also start doing dca into individual reit counters via maybank ke's monthly investment plan once you know what counters you are going for. Hope this helps" Passive: You can simply start on the STI ETF and buy the index fund. It buys into the 30 companies that form the STI index. First investment was in Starhub, because I read a random article saying Starhub was a good stock to buy. That was 4 years ago. I made a 30% loss after selling it last year :( Moral of the story: don't blindly follow "financial advice". Do your homework!